Allen Chester is both an artist and design engineer having degrees in Fine Art and Mechanical Engineering with over 30 years of experience in both fields. Allen has exhibited his art extensively over the years. The last decade has been devoted primarily to the development of insightful art filled with secrets of antiquity. 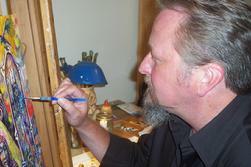 Allen paints primarily with oils but has experience with acrylic and other mediums. Most of Allen's art is available as special edition prints. Original paintings and commissioned work are also available. NOTE: You are ordering the Templar Tarot: the Journey deck, pub 2009. It is a combined deck that includes the entire contents of the first edition Templar Tarot (pub 2001) plus a second Major Arcana with a detailed descriptive book written by Templar author and historian, Stephen Dafoe. Orders are typically shipped within 3 business days from Richmond, Virginia, US. The cost for each deck is $39.95 USD plus shipping. Thank you. This expanded edition, Templar Tarot: the Journey, includes 101 cards that take us further along the historical endeavors of the infamous Knights Templar. Unlike any other tarot deck, the Templar Tarot deck features 2 sets of Major Arcana cards taken from the original art of American Artist, Allen Chester. The significance of the art is interpreted by renowned Templar historian and Canadian Author, Stephen Dafoe. Dafoe draws on his vast knowledge of the Templars and related traditions to see the mystical messages that Chester has captured in the art. As with the first edition of the Templar Tarot, this tarot deck will also be a limited edition. This is a perfect deck for those that use tarot as a meditation tool. 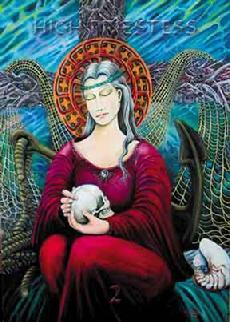 "The cards of the Templar Tarot are especially rich in symbolic meaning. They are inspired by the compelling history of the Knights Templar � a story filled with archetypal characters and events. Allen Chester�s dramatic paintings capture these timeless elements. Their images and patterns create a symbolic picture. By meditating on this picture, you discover hidden truths about yourself and your world. " Joan Bunning is the author of Learning the Tarot: A Tarot Book for Beginners, Learning Tarot Reversals and Learning Tarot Spreads. Visit www.learntarot.com to see her free online course. "It is a rare treat to read a book on the Templar Tarot written by an acknowledged Templar expert who is as insightful in matters of symbolism as Stephen Dafoe. A fascinating treatise that will be a useful addition to my personal research library." Tim Wallace-Murphy is the author of Cracking the Symbol Code - Revealing the Secret Heretical Messages encoded within Church and Renaissance Art, The Knights of the Holy Grail - the Secret History of the Knights Templar and Hidden Wisdom - to be published in April 2010. Visit www.timwallace-murphy.com. "One of the metaphysical geniuses of the 20th century, Manley Palmer Hall, linked a significant part of the tarot�s history to the sacred order of the Knights Templar. Now, the 2lst century Templar Tarot: The Journey recreates this link in magnificent narratives and imagery. The Birth, Life and Death of the Templar�s are expressed through the profoundly insightful writings of Stephen Dafoe and the extraordinarily intuitive tarot images of Allen Chester. Together Dafoe and Chester meld a true trionfi, a triumphant tarot processional embodied by the Templar Tarot gifting the world with a remarkable odyssey." Amber Jayanti, founder of Santa Cruz School for Tarot & Qabalah Study, author of Living the Qabalistic Tarot, Tarot for Dummies & Principles of Qabalah. Visit her website at http://practical-mystic.com/. Allen Chester's art was displayed at the Hampton Roads Convention Center in 2009. The Convention Center is visited by over a quarter million people each year from all over the world. The art chosen for this exhibit was the wildlife art of the herons that are indigenous to the shoreline communities along the east coast. Click here to visit the Hampton Roads Convention Center website.